Can You Recognise The Baahubali Actress In This Throwback Pic? It's not Thursday yet but that does not mean there's a dearth of throwback posts on Instagram. There arrived one from actress Tamannaah Bhatia, who shared an old photo of hers with her mother and accompanied it with heart-touching caption: "Just her shadow... throwback to this beautiful memory with the best friend, the confidante, the support system. #Mom #Throwback." The photo posted by Tamannaah garnered as many as 1,25,652 'likes' in two hours and elevated itself to the status of a viral post. Her colleague Shruti Haasan was one of the first ones to spot the photo and wrote: "Awww... look at you!" We too have the same reaction. However, a section of netizens thought that Tamannaah still looks the same. 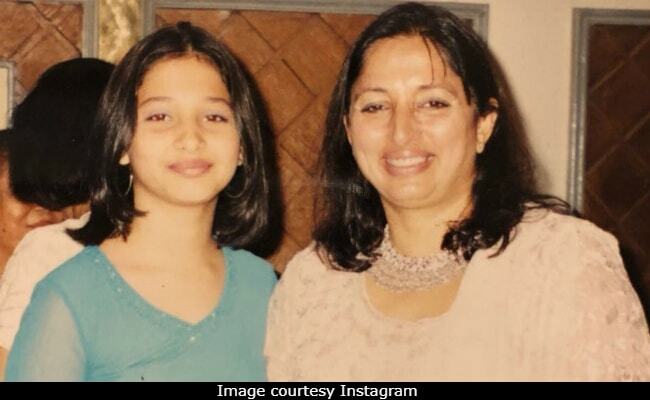 "I can't find any difference between this picture and current picture," read a comment from a fan while another added the resemblance between Tamannaah and her mother is quite uncanny: "Your mum and you look so much alike it's uncanny." Here's another throwback photo, featuring baby Tamannaah: "Happy Children's Day! Stumbled upon this childhood picture and couldn't stop myself from posting it. Never let the child in you die. Be curious, ask questions, be cheerful and love with no prejudice," she captioned it. Happy #ChildrensDay! Stumbled upon this childhood picture and couldn't stop myself from posting it. Never let the child in you die. Be curious, ask questions, be cheerful and love with no prejudice! Tamannaah Bhatia is best known for her starring role in S S Rajamouli's Baahubali series of films - she played the role of Avanthika, a warrior from Devasena's Kuntala kingdom, and also the love interest of Mahendra Singh Baahubali. She also has films like Paiyaa, Happy Days, Himmatwala and Badrinath on her resume. Tamannaah is also working on the Telugu remake of Kangana Ranaut's Queen.